Have you ever wanted to learn a foreign language but you were overwhelmed because you thought it would take forever? Were you curious about how many words that it would take for you to be considered fluent? Did you give up before you even started because you didn't know where to begin? Here is a simple method that I have for you. 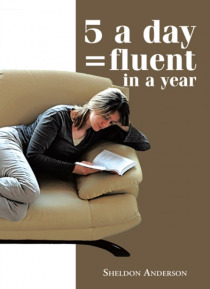 I call it 5 a day=fluent in a year All you have to do is learn (memo… rize) 5 words a day. There are 365 days in a year. So times that by 5 and what do you have? You have 1,825 words in your arsenal (by the way, one only needs to know 1,800-2,000 words to be considered fluent). For the 4 years that it would take a high school or even a college student to learn enough vocabulary, I have done it in a year on my own. I am giving you about 2,000 words, all in the order that I have learned them. These are not impractical words that we hardly ever use like: spaceship, and rocket scientist. Come on! Do we use words like that everyday? Of course not. We use words like knife, fork, spoon, butter, play, work, sing, and dance. These are the kind of words that I'm giving to you. I have done all the work for you. I went through the entire Spanish/English dictionary from A-Z, and pulled out all the words that I know are the most necessary in everyday language. All you have to do is take the exact order that I have given them to you and learn 5 a day. That way, there's no being overwhelmed by taking up too much time to learn in a day and wondering where to go next. It is fun to do because it only takes a few minutes a day. First, look at the five words and get familiar with them. Then, place your hand over the Spanish and look only at the English to see if you memorized the Spanish correctly. Then take your hand off the Spanish to see if you got it right. Do that for all 5 words. Then, when you go the next day to learn 5 more words, first go back to the 5 from the day before and make sure you still remember them. That's it!